"Are you somebody I'm supposed to know?" Sundance Selects has debuted the first official trailer for Josh Kriegman & Elyse Steinberg's documentary Weiner, which won the Grand Jury Prize for Documentary at the Sundance Film Festival this year. The doc is an "examination of disgraced New York Congressman Anthony Weiner's mayoral campaign and the landscape of today's political landscape." I heard rave reviews from many of my friends while at Sundance, meaning it's more than just a story about Anthony Weiner and has much more to say about what's going on with politics. This is a great trailer - the kind that shows you just enough, pulls you in, makes you curious about seeing the entire film. Looking forward to catching this. 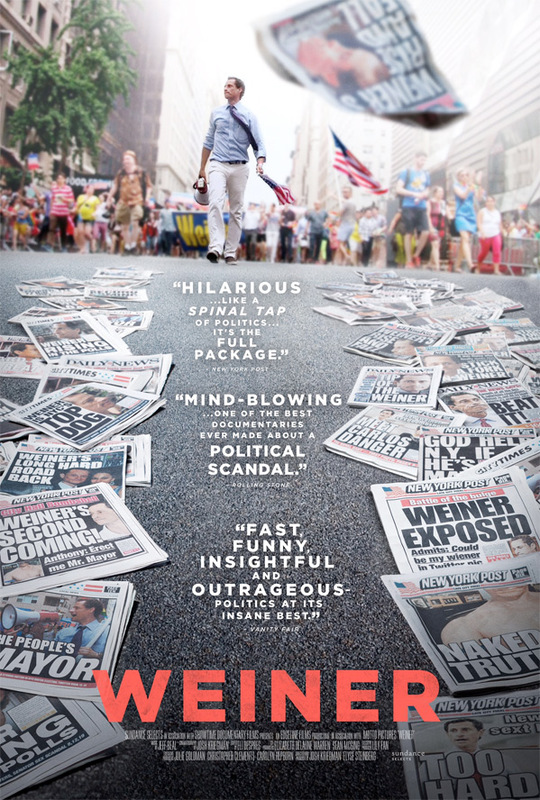 Description from Sundance: With unprecedented access to Anthony Weiner, his family, and his campaign team as they mount his New York City mayoral campaign, the film documents the impending political meltdown of epic proportions. What begins as an unexpected comeback from a disgraced ex-congressman takes a sharp turn once Weiner is forced to admit to new sexting allegations. As the media descends and rips apart his every move, Weiner tries desperately to forge ahead, but the increasing pressure and crippling 24-hour news coverage halts his political aspirations dead in their tracks. Weiner is co-directed by Josh Kriegman & Elyse Steinberg, both making their feature directing debut. The film premiered at the Sundance Film Festival, where it won the Grand Jury Prize. Weiner opens in select theaters on May 20th. It looks quite interesting, but I'm sure every one is a bit tired of American politics now. The leader of my country did stick his wang in a dead pigs mouth and somehow he's managed to do ok, so maybe there's hope for this guy. Funny how we can forgive some behaviors from some people, but others NO WAY. ...still one of the most aptly-named politicians of all time.